Bryn Terfel as Boris; photo credit – Chris Christodoulou. 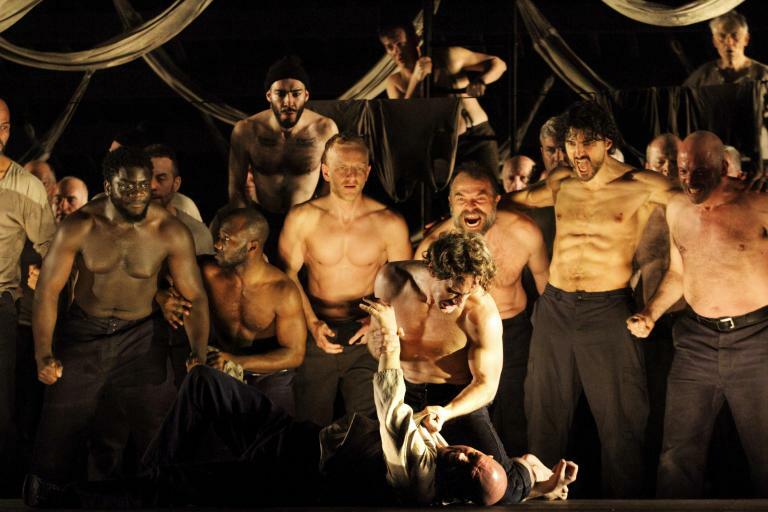 The Royal Opera’s production of Boris Godunov was reviewed twice for Seen and Heard International, once by Mark Berry in the auditorium and once by Jim Pritchard (cinemacast). I was lucky enough to see Richard Jones’ production as part of that run, as an audience member, a powerful experience that left a huge emotional mark. Shorn of the staging, and so of the repeated mime of the murder of Dmitry (which wore a bit thin on stage), this Prom performance enabled us to zero in on Mussorgsky’s original 1869 score, a straight-through experience. There is no Polish act, for example, and therefore no Marina, and having it performed sans interval does rather concentrate the mind on Mussorgsky’s masterly writing. The more static element put into the spotlight the other main protagonist of the opera, the vox populi – the chorus. And how magnificent they were. Sculpted impeccably by Pappano, the choruses had real power, the ROH Chorus itself infinitely malleable and flexible in its capabilities. Off-stage chorus effects were managed by quiet singing. (The other big effect, of course, is bells, so vital a part of this opera, be they celebratory or funeral knell; they made a fine if not spine-tingling impression). Pappano’s own direction, though, is not echt-Russian. There is a lyricism there that speaks of his affinities to Italian opera, something which diverts us away from the chthonic Mother Russia heart and soul of the music, especially in its pre-Rimsky garb. Perhaps reflecting that is the vocally rather light Boris of Bryn Terfel. Those who enjoy the jet-black Russian basses may find some disappointment here, but there is no doubting Terfel’s intense honesty. His entrance, prior to the famous “Skorbit dusha” (My soul is sad) as the great choral hymn to his glory was in full tilt, drew the eye magnetically; from in front of the organ, Terfel demonstrated the uttermost tenderness with his rather baritonal timbre. The final stages of the opera, though, were magnificent, his entreaties to his son to rule according to right, his warning against the scheming boyars and his ever so tender plea for Fyodor to take care of his mother so astonishingly done. Most memorable, perhaps, was Terfel’s final request for forgiveness (followed by the boyars’ whisper of “Uspne!”; he has passed away) and then a beautifully shaped third horn solo from Huw Evans. There was the added bonus that Terfel’s voice contrasted well with the far darker sound of Ain Anger’s Pimen, an assumption that rivaled and at times surpassed that of Terfel. Pimen’s long monologues in Part Two were an example of someone completely inside a part, from the resonant opening (“Just one final tale”) through to the climactic strains of his witnessing of “the bloody sin”. As Shuisky, John Graham-Hall made for a lanky schemer, while Kostas Smoriginas was a fine, full-voiced Shchekalov. Andrew Tortise was a characterful Simpleton. For the Covent Garden run, there was the luxury casting of John Tomlinson as Varlaam. It was too much to hope that he would be here for the concert performance; instead, Andrii Goniukov was a fine substitute in his famous Kazan song (a fine turn on the spoons from Harry Nicholl as Missail); his Hostess, the always impeccable Rebecca de Pont Davies, was magnificent in the role, both in character and in voice. Vlada Borovko reprised her excellence as Xenia, but Clarissa Meek took over, succesfully, from Sarah Pring for Xenia’s Nurse. All credit, too, to the young treble Ben Knight as a strong-voiced Fyodor and Jeremy White as a fervent Nikitsch. It was good to have such a significant performance so close to the opening of the 2016 season, cast from strength and preserving the piece’s intensity throughout.